Join me on my Stitch Journey as I explore art and life. I am spending this week in Vail Colorado at the Full Circle Mastermind Summit. The purpose of this Summit is to spend time working on business planning and building. We work on our own respective businesses and come together as a group to brainstorm ideas and problem solve with group discussions. It is always a great week for me. It allows me to think bigger, get some different perspectives and reminds me to focus on what is the most meaningful. It is also a time for me to remind myself of (or fine-tune) my business values, my mission and my vision. So often we forget to take time to work on the things that are important to us. We forget to pause and look at the big picture because it is so easy to become overwhelmed by the details of the day to day. We forget to make sure our life has a balance that makes us happy. We can spend so much time on our art or our business that we neglect family or vice versa. OR: spend so much energy on everyone else that we neglect ourselves and our dreams! This week my planning will be focused on my new adventure! The Thread Lab: a WonderFil Threaducation Center. More details on this very soon. In the meantime you can join The Thread Lab Facebook Group. Take a few minutes or a few hours this upcoming week and join me in spending some time thinking about your big vision, your dreams and your big picture. I would love to hear what they are. Liz believes that CREATIVITY is the new superpower! 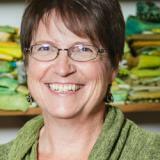 She is a mixed media textile artist living in Colorado. Liz is author of First Time Beading on Fabric and she is co-author of 2 books, Fabric Embellishing: The Basics and Beyond and Threads: The Basics and Beyond. Liz loves teaching and sharing the joy of making stuff in her articles, classes and workshops. join the fun in her free on-line book studies in the discussions forum. Is Your Stash Holding You Back? What is the Best Sewing Machine Thread?